I have a vintage Heuer up/down chronograph with a strange Heuer logo. I posted some pictures of the watch a couple of years ago at the Heuer forum, but no one had an answer. I have since then tried to collect as much info as possible, and have found some information. I have seen some claims that this was a military model, and most owners date them to late 1930's (1938) or very early 1940's. The movement is the same on all 2HEUER2 I have found. An unsigned Venus 170. I know that Heuer produced an up/down chronograph with Valjoux 77 later, that is fully signed. None of the Val.77's that I have seen has the 2HEUER2 logo. The 2Heuer2 has Nickel case, the later Valjoux 77 has steel case. 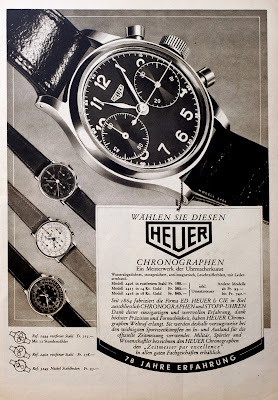 I have just found a Heuer advert from 1942 that shows the little chronograph. This is the first time ever, I have seen any information about these chronographs. The are not military, but Heuers cheapest chronograph offer. There is at least two different dial design for Ref.3249, one with telemeter and tachymeter, and one, like mine, with a seconds scale. 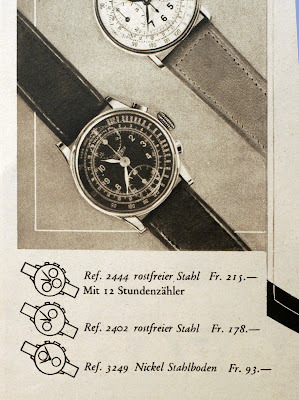 This should confirm that these are genuine early Heuer Chronographs. 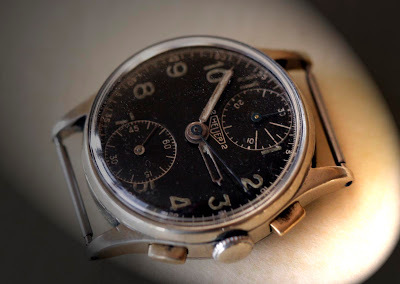 Heuer did not sign all movements untill 1945. Thanks for bringing that up! Any translation? Wish I knew swede/ danish. The auction must be over by now? Does anyone know a good email contact for contact Heuer for validating vintage Heuers? BTW, Jarl sold his 2Heuer2 to me. I'm happy to own this piece of Heuer history. Hi Arthur. Nice to hear that my little Heuer has come to a good home. I believe I've managed to get my hands on the telemeter and tachymeter version. It's in the post, so I'll get some pics up as soon as I can. Is it the one sold on Ebay with the white dial? It looked very interesting. Do you think I should keep it original or have it restored? Do you think I should keep it original or get it restored?